DCIST researchers are addressing the problem of the generation of state-based abstractions for resource constrained agents. Specifically, we are interested in understanding how imposing such constraints limit the ability of an agent to make an informed and optimal decision. We formulate the problem using information theoretic principles to construct an optimization problem incorporating these constraints, the solution to which provides a multi-resolution hierarchical representation of a state-space. 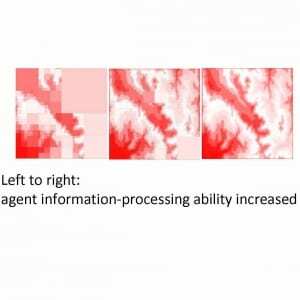 The granularity of the resulting representation is governed by a tradeoff parameter representing the agent’s information-processing abilities. Some early results of this work can be found here.